Currently, there are two basic approaches to weight loss surgery: restrictive operations and operations that combine restriction and malabsorption. Restrictive procedures (such as an adjustable gastric banding and sleeve gastrectomy) simply limit the amount of food that a person can eat at one time. Combination procedures (such as gastric bypass) help give patients the feeling of satisfaction from only a small amount of food and lessen the amount of calories that are absorbed from the food eaten. Laparoscopic Gastric Bypass is the most commonly performed bariatric procedure. It is a combination procedure (both restrictive and malabsorptive). The stomach is reduced in size, and parts of the small intestine, where most of the calories are absorbed, are re-routed. Sleeve Gastrectomy is a type of restrictive weight loss operation. It reduces the amount of food you can eat by reducing the size of the stomach. A thin vertical sleeve, or narrow section of the stomach, is created by using a stapling device, removing approximately 80% of the total volume of the stomach. Adjustable Gastric Banding surgery is one of the safest, most popular, and affordable medical weight loss procedures available. The surgery is performed by placing a band around the uppermost part of the stomach, thereby limiting the amount of food one can eat at a time. 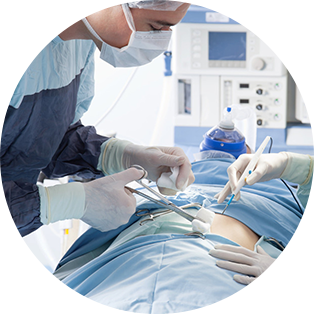 A revision operation is used to correct prior weight loss surgery that has failed. If you have unresolved complications or if you have not achieved your desired weight loss, a revision operation might be right for you. The Robotically-Assisted Gastric Sleeve provides your surgeon numerous technical advantages that include improved ergonomics, better visualization, and more advanced instrumentation. Weight loss surgery, or bariatric surgery, was developed in the 1950′s and has been revised over time to be a safe and effective treatment for morbid obesity. The first laparoscopic gastric bypass was performed by Dr. Alan Wittgrove of San Diego, California (mentor to Dr. Cavazos, medical director) in 1993. In 2005, an estimated 175,000 people in the United States underwent bariatric surgery, according to the American Society for Metabolic & Bariatric Surgery. Currently, there are two basic approaches to weight loss surgery: restrictive operations and operations that combine restriction and malabsorption. Restrictive procedures (such as a adjustable gastric banding and sleeve gastrectomy) simply limit the amount of food that a person can eat at one time. Combination procedures (such as gastric bypass) help give patients the feeling of satisfaction from only a small amount of food and lessen the amount of calories that are absorbed from the food eaten. Read more about the different types of weight loss surgery in our Types of Surgery section. Bariatric surgery has proven to be not only the most successful method for weight loss, but is also responsible for the resolution or improvement of many other serious medical problems. For example, studies have shown a resolution of Diabetes in 83% of patients, and an 82% risk reduction for cardiovascular disease. Gastroesophageal Reflux is resolved in 72-98% of cases, as well as 74-98% of Obstructive Sleep Apnea. There are several studies that are also showing a significant decrease in several cancers as well. Overall, there is a 30-40% reduction in 10-year mortality. Your surgery is only the first step towards your successful weight loss. Follow-up with our medical team is critical to ensure you maximize your weight loss and that you safely do it . Lab work needs to be done periodically to monitor your nutrition and vitamin levels, and regular post-op visits are necessary to make sure you are on the right track in terms of your diet, exercise, and behaviors. Weight loss surgery is a lifetime journey; not a one-time event. We look forward to helping you on this journey every step of the way..